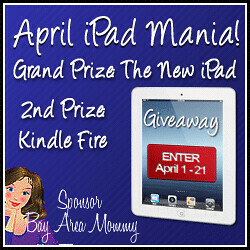 April iPad 3 & Kindle Fire Mania Giveaway! WELCOME TO THE APRIL iPAD MANIA GIVEAWAY!!! I've teamed up with Bay Area Mommy some other awesome bloggers to bring you this amazing chance to win the two hottest tablets in the market today! Giveaway starts April 1 at 12:01am EST and ends April 21 at 11:59pm EST. There are no mandatory entries but there are lots of ways to gain more entries to to the giveaway. The more tasks you complete, the more chances of winning! Open worldwide. Must be at least 18 years old to be eligible for the prize. This giveaway is in no way sponsored, endorsed or administered by, or associated with, Facebook, Twitter, Apple or Amazon. Winners will be drawn on April 22 and will have 48 hours to respond to the notification email. If you don't want your winning email to end up in spam, make sure you whitelist alice@bayareamommy.com!